One of the problems with capillary electrophoresis is a lack of versatility regarding manipulation of the separation selectivity. A new and potentially universal concept is to introduce an ion-exchange component into a separation so that the migration of analyte ions is influenced by both their electrophoretic mobilities and their chromatographic properties. 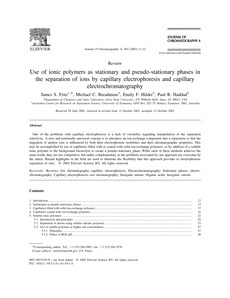 This may be accomplished by use of capillaries filled with or coated with solid ion-exchange polymers, or by addition of a soluble ionic polymer to the background electrolyte to create a pseudo-stationary phase. While each of these methods achieves the same result, they are not competitive, but rather complementary as the problems associated by one approach are overcome by the others. Recent highlights in the field are used to illustrate the flexibility that this approach provides to electrophoretic separation of ions.